John Dory are olive-green in colour and have a large black spot with a white or yellow margin on each side. Their body is covered with minute scales. John dory have 10 spines with long filamentous membranes between them on their dorsal fin. An unusual looking, scaleless, plate-like fish with a deep, circular and laterally-compressed body, a big head, huge extendible mouth, and long, filamentous dorsal fin. John dory exhibit vary from greenish-brown to olive or grey on the back and are lighter on the flanks and belly, sometimes with dark patches or even a golden sheen. A large black spot or blotch bordered by a light edge is prominent on each flank. John dory are found in cool and temperate waters all over the world. In Australia they are confined to the southern half, from about south eastern Queensland to South Australia, with sporadic appearances in Tasmania and the south of Western Australia, frequenting bays, harbours and estuaries, as well as deep reefs out to the edge of the continental shelf. They are also found in the Western Indian Ocean, eastern Atlantic Ocean, Mediterranean Sea and the waters of New Zealand and Japan. John Dory are found in depths from 5 metres to 360 metres, but are uncommon in waters deeper than 200m. They live close to the seabed. John Dory are known to spawn off the coast of New South Wales in late summer and autumn at depths of 50 to 100 metres. They reach a maximum size of 65 cm total length and a weight of 3 kg. John Dory are taken primarily as a bycatch of the South East Fishery. They are trawled from depths of between 50m and 200m off New South Wales and eastern Victoria. 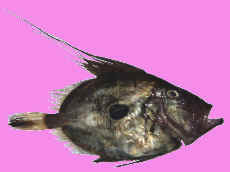 John Dory are often caught by Recreational Fishers using live baits, and on inshore reefs, anglers may catch John Dory using whole fish or flesh baits. Many of the John dory taken by anglers are incidental captures landed while fishing with live baits for flathead, mulloway or kingfish. If slightly smaller baits are used, the chance of taking a dory increases. Estuary and harbour anglers specifically targeting John dory mostly use handlines or light rods and small live baits, sometimes trimming the tail of the bait with scissors to slow it down. Over the deeper reefs, John dory take cut-flesh strips and whole small fish such as pilchards, as well as deep-fished live baits. John Dory, the premium fish for exclusive dining. John dory are commercially caught using Longliner, Danish seining and trawled. John Dory fillets have white firm flesh. Very deep, short and tapering sharply. Rarely skinned with small and barely detectable scales. Buyers and sellers of John Dory and other dories are listed.